The April 25th club meeting will be held at Pioneer Drive Baptist Church at 7:00 p.m. in room 111. (enter on the northeast side of the building) See you there. Beginning 18 years of unparalleled growth and success, Still Waters Bass Club is the premiere bass club in the Big Country. The club continues to be a Christian focused bass tournament association of men and women who love to compete and fish together. The monthly club tournaments are generally within a 100 mile radius of Abilene and usually have between 60 to 70 entries in the spring tournaments to around 40 to 50 entries each month for the fall tournaments. The purpose of the club is as always to offer tournament bass fishing opportunities in a nondenominational Christian family environment and atmosphere. 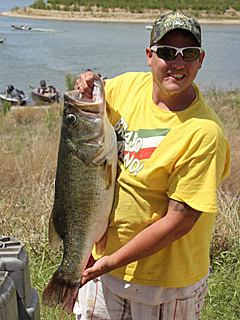 Still Waters Bass Club tournaments are held on the first Saturday of each month with an entry fee of $35. Monthly meetings are held on Thursday nights, 9-10 days before our scheduled monthly tournament. The meetings consist of guest speakers, information sharing, and lots of good fishin' ribbing. If you would like to be a part of a family oriented, fun, highly competitive bass club; then click the "How to Join" page for further information or click the email below and we will contact you with a personal reply. Check out the rest of the site for additional information and join us for the next monthly meeting. 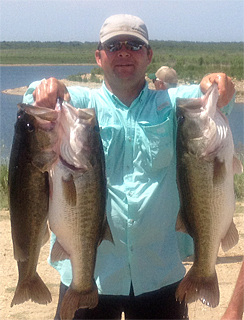 Travis Hanson landed a three fish stringer weighing 23.94 at Lake O.H. Ivie on February 12, 2011. His three fish weighed 8.40 lbs., 8.17 lbs. and 7.37 lbs. What a day fishing on Lake Ivie.